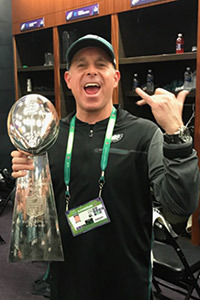 Doctor Frank Brady, Chiropractor for the Philadelphia Eagles and Flyers, is dedicated to helping his patients achieve their Chiropractic goals. Dr. Brady graduated with a Doctorate in Chiropractic from the Pennsylvania College of Chiropractic in 1994. Since graduating he has been educating colleagues and patients, and has helped thousands of people regain mobility and lead healthier lives overall.